Our provisional beer list is now online here. Please keep an eye on (1) our Twitter feed and (2) our Tickets page which we'll update when we can (jobs, travel, life etc...!) with any updates from our ticket outlets. The provisional list of beers from Sussex breweries only is up on our Beers page. We hope to update this with more details (and more beers from out-of-county) in due course over the coming weeks. We also have a ticket update from last week on our Tickets page. Brighton Racecourse, Freshfield Rd, Brighton, BN2 9XZ. Brighton & Hove buses 2 & 22 from Churchill Sq stop close to venue. 150+ real ales from across the UK, 40+ ciders + perries, hot + cold food avail inc vegan + veggie options. Open: Fri 11am-3pm, 5-10pm; Sat 11am-8pm. Admission: Fri aft £6, eve £8; Sat £5 all day, £3 after 330pm for NUS card holders (pay on door only, no adv tkts). Adv tkts avail from 12 Jan-16 Mar from Evening Star, Brighton; Gardeners Arms & Brewers Arms, Lewes; Duke of Wellington, Shoreham; Selden Arms, Worthing; Beer Essentials, Horsham; Brewery Shades, Crawley; Eagle, Eastbourne; Tower, St. Leonards. 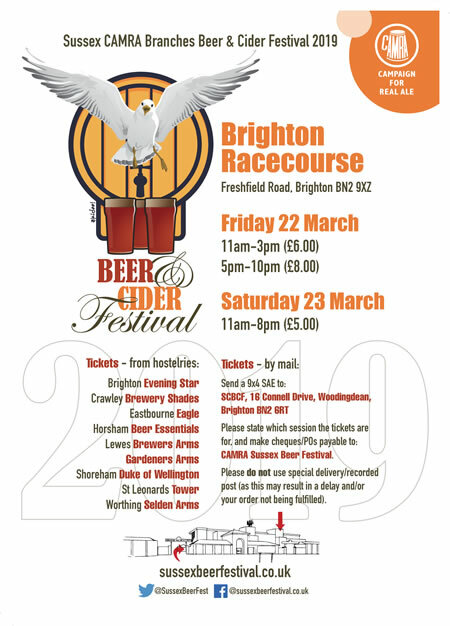 Also avail on the door or via mail order from 16 Connell Drive, Woodingdean, Brighton BN2 6RT; pls state which sess you require + enclose a 9x4 SAE with your payment; cheques or postal orders payable to ‘Sussex CAMRA Beer Festival'. No rfnds for mail orders after 13 Mar. Tkt price inc free glass + prog. Card-carrying CAMRA membs can obtain £2 worth of beer tokens at Membs stand. 18+ only, Challenge 25 will be in operation + bags may be inspected. All bars will operate a token system, token rfnds will only be given before ‘time’ is called, surplus tokens + donations going to this yr’s charity Sussex Heart. Details of ticket prices and outlets can be found on the poster (below) or on the relevant pages of this site. We expect sales to commence on or around 13 January 2019. We've also updated maps and descriptions of how to access our venue at the Racecourse.